When your house, decks, or out buildings are not properly sealed you are invited unwanted nuisance wildlife to move in. One of the main pest animals that burrow under building's are skunks. We are able to remove skunks in Beaverton and seal up the areas to make sure skunk's and other unwanted pests can not get back in. Skunks are most commonly know for the strong odor they can spray when scared. 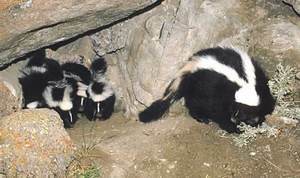 A skunks spray is the strongest odor known to man and as many people know if can be very difficult to get out. You should never approach a skunk and try your best to never let a pet approach a skunk. We also receive many calls to come out and remove a skunk someone else has trapped. The hardest part about getting a skunk is transporting this with out getting sprayed. For Beaverton Skunk Control and Removal Call 503-201-2432!